There are so many creative people in this Second Life place. A few of them got together and decided to start making interesting movie trailers, with the purpose of creating an eight minute movie short at the end of it all. To "put a fun front" (in Mr. Sputnik's words) on their work, they created a portion of the Penzance sim named Caledon Studios. It looks a lot like a cross between Hollywood and Victorian Steampunk, with little stores devoted to costuming and photography and filming, and a few neat sets where people can play and snap photos. What an excellent idea. I love it when people create grown-up playgrounds in Second Life. Makes my journeys in this world feel worthwhile! 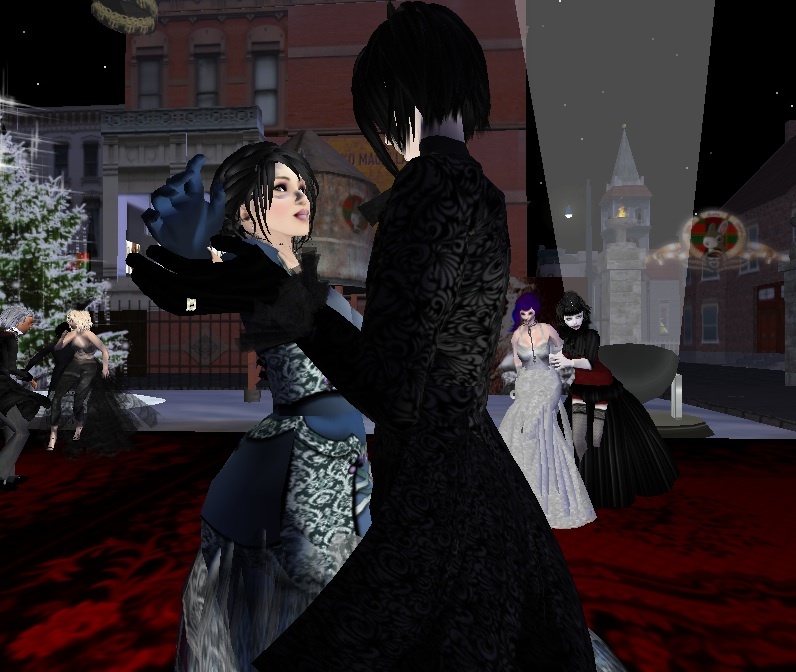 With movie music playing in the background, I danced the Charleston alongside Miss Darkling Elytis, who has a press located in the Studios. I also spotted a glamorous couple completely clad in ~silentsparrow~ (picture above). They looked so elegant I had to snap a photo. Xyrra Reymont & Chaos Richard are wearing ~silentsparrow~ ashes to ashes (the lady) and limited edition Kiri in night (the gentleman). I'm wearing OH! WHAT A NEAT...BOUTIQUE's Overkill frock (I was a bad girl and didn't install the prim skirt script). Under it, fishnets from a freebie box, and the sorrow undershirt in ash from the ~silentsparrow~ sorrow set. Also, Tillie hat by Elegance Hats, Hiccup's Amelieish hair, and Tete a Pied's Gothic Corbeau skin. 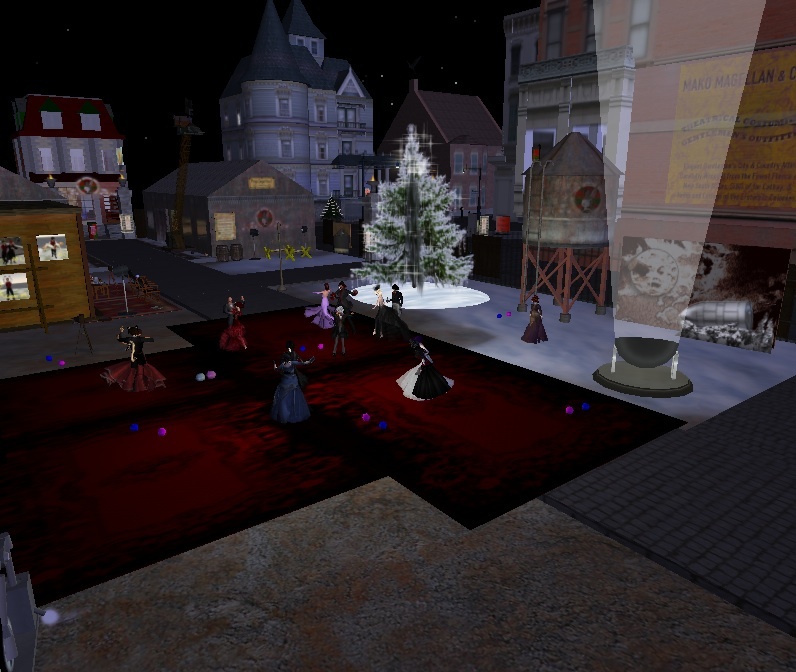 Darkling (left) is wearing the Brigitte silver gown by Ivalde, Twiggy bob hair by Cake, Lirilith skin in LE Nomine, Shiny Things classic pumps, and the new Mechanica jewelry set by Shiny Things. Forgive me for not linking! I'm running off to RL now! ohhh aye that was a glorious fun party! a note, though... I was wearing the Hermia hairstyle earlier in the evenin, but the photographe here shows me in the Twiggy by Cake, dyed purple and red.